Sometimes it's okay to ride other people's coattails. 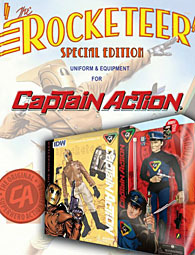 Captain Action was created in 1966. Ideal Toys was looking for something that could compete with Hasbro's GI Joe; enter Stan Weston. Weston had sold his GI Joe idea to Hasbro, and used that money to form a promotion company called Leisure Concepts (eventual parent-company of the infamous 4Kids). Leisure Concepts represented DC Comics, Marvel, and King Features, so he pitched Ideal the concept of a single doll that would be able to wear costumes of various heroes. This not only cashed in on GI Joe, but also the resurgance of superheroes spurred by Batman and on Barbie's closetful of accessories (each sold separately). The toyline only lasted two and a half years, but has seen a few attempted resurrections since the late '90s. But those of us who aren't into 12" figures have been out of luck until now. This figure was created as part of the Amazing Heroes Kickstarter, so the figure is done in the style of Mattel's old Secret Wars toys - the same smooth(ish) body, the same distinctive squat, everything. 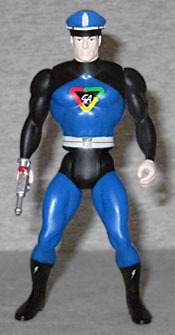 His costume details are just painted on; when he wasn't wearing another superhero's skin like a mask, Captain Action (whose real name, at various licensors, has been Clive Arno and Miles Drake) had his own stylish blue-and-black costume, which is why he was perfect for outside merchandising. 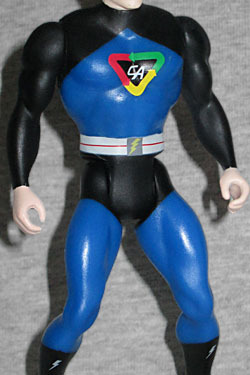 He has his triangular logo on his chest, a lightning bolt on his belt buckle, and small silver bolts on his boots - those are features taken from his most modern incarnation (made by Round 2 in 2012), not the '60s original. 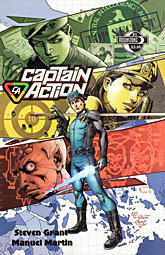 The original Captain Action was not a good-looking man. The painting on the front of the box made him look like Bing Crosby, but the actual figure, well... "clinically depressed Ed Harris" would probably be the best way to describe him. This version is much more conventionally handsome, though it doesn't look like the Round 2 Cap, either. An all-new face! The skintone is rather pale and sallow, rather than the hearty pink of previous figures. You need to get some sun, Cap! The Amazing Heroes are identified as 4.5" action figures, but that's not quite right - thanks to the squatty stance, Captain Action stands a little under 4⅜" tall. The articulation is a throwback as well - nothing but the Big Five, because that's the way things used to be done. 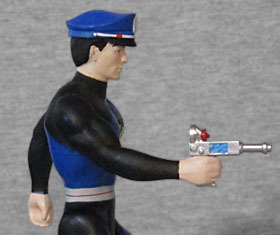 He does come with two accessories: the cap that makes what would otherwise be a pretty standard superhero costume feel more military, and a new version of the gun he's been coming with since 1966. The gun is silver with blue and red paint apps, and has all the appropriate retro styling. He can hold it in either hand. Like Masters of the Universe a few decades later, the original Captain Action came with a mini-comic packed in the box. But that wasn't his last encounter with the printed page: he's also had a series in the '60s from DC Comics, and several from Moonstone Books starting in 2008. None of them have really been able to play up the abilities of the character, since that would require licensing heroes from other companies, but it does mean that even while this toy doesn't have any costumes to wear, he still has a pedigree of being a simple super spy and is perfectly ready for adventure even without wearing someone else's underwear.